A while back, a publisher called First Second Books approached sent an email to TVGB asking if we were interested in reviewing some of their graphic novels. They weren’t directly video game-related, but gamers tend to like graphic novels, so it seemed like a worthy project. Due to my interest in Greek mythology, I chose a book called “Hermes: Tales of the Trickster,” by George O’Connor, featuring stories about the titular god. The book was released on January 30th, but it took a while longer to reach me; I had already forgotten about the whole thing by the time it came, given that the originally email conversation took place almost a year prior. Was it worth the wait? 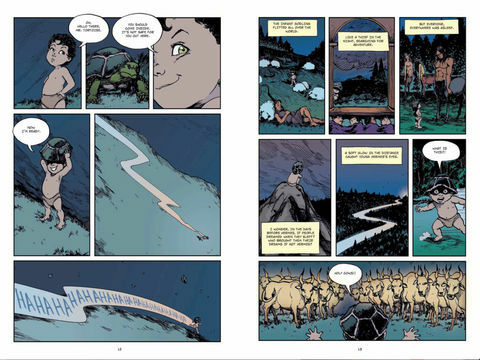 “Tales of the Trickster” is actually part of a serie of graphic novels called “Olympians,” each one of which focuses on a different god from Greek mythology. The books are consistent with each other in terms of which myths they follow and how they depict the characters, which means one is probably better off reading them in order, but there’s no harm in starting from this one either. 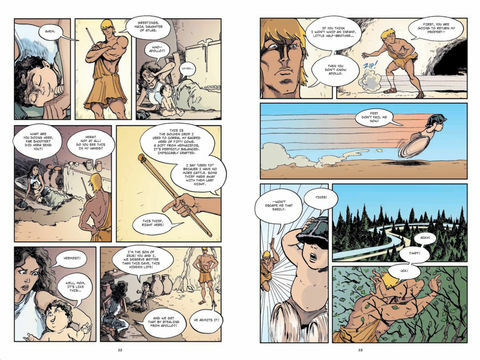 Through a frame story about a hungry traveling storyteller, the book illustrates a handful of legends that feature Hermes in some way. The stories are told in a modern style, which makes them more welcoming; the characters and narration use modern vernacular, while still making the characters feel right. The variety of stories featured was pretty interesting as well, featuring some lesser-known myths and interpretations thereof. It’s also not entirely limited to stories about the title character, for better or worse, but the other stories are interesting too. From the perspective of someone trying to learn about the source material, there are footnotes of sorts from the author, but they don’t go into a ton of depth. As long as you’re OK with learning one version of a story that has been interpreted in several other ways, it does the job nicely, but it’s definitely written more for entertainment; it’s an easy and casual read, which makes it work well as something to read between gaming sessions. My feelings on the art are a bit more mixed. Generally speaking, I really like the depictions of the gods in this book. Greek gods are often depicted as being pretty generic bearded men, or as just normal looking people in elaborate costumes, so it’s nice to see a unique visual identity for each. They aren’t overly elaborate, but it’s generally clear who is who. Some of them make a bit more sense than others, though; Apollo is pretty generic, for example. But the designs for Zeus and Hades are clever, combining the traits usually associated with the characters and a more relatable down-to-Earth depiction. In terms of the overall art style, though, it could definitely be better. I recognize that the art is stylized intentionally, but given the dynamic art seen so often in graphic novels these days, it doesn’t exactly jump out at you through the visuals alone. That said, I definitely recommend the book. 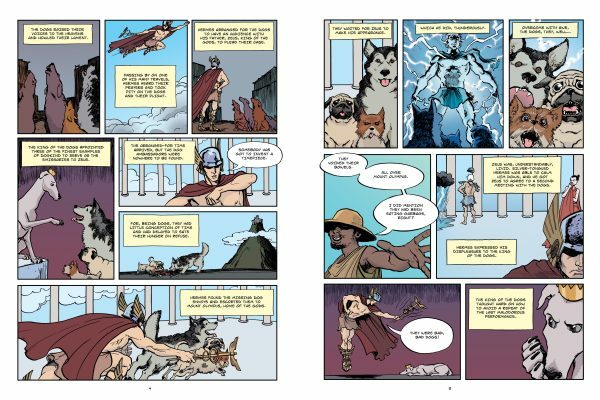 Greek mythology is full of interesting and compelling stories, and this graphic novel does a very good job of translating those stories into a form modern graphic novel readers can identify with. The whole point of myths is to understand the world around us, so formatting them for the time makes sense. The characterization and writing style humanize the characters well, while still creating a compelling and accurate retelling of the classic stories. 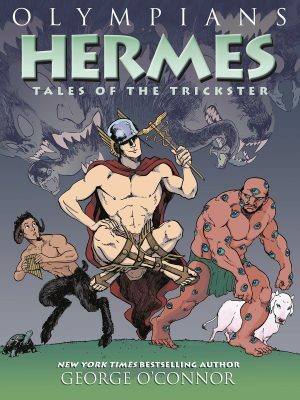 “Hermes: Tales of the Trickster” isn’t perfect in its writing, and the art style may not be to everyone’s taste, but it’s a nice casual read that can open readers up to so much more in the form of deeper dives into the mythology. O’Connor’s humanized gods are a good way to get started.